Detector dogs trained by Auburn University’s Canine Performance Sciences (CPS) at the College of Veterinary Medicine have been part of a multi-team effort with University of Florida’s Institute of Food and Agricultural Sciences (UF/IFAS) and the Florida Fish and Wildlife Conservation Commission (FWC) in unique projects to target Burmese pythons in Florida. Pictured with a python is from left: Alex Dyson with the University of Florida, Ashley Lawrence with the Florida Fish and Wildlife Conservation Commission, Bart Rogers with Canine Performance Sciences, and Vito, one of Auburn’s detection dogs. Two projects included using detection dogs and Irula tribesmen to help remove pythons from environmentally sensitive areas. In their first eight days on the job, the Irula tribesmen—world-renowned snake catchers from India—removed 13 pythons, including four on their first visit to North Key Largo. UF/IFAS researcher Christina Romagosa and her team worked with Auburn’s CPS. Work by the Auburn/Florida team focused searches in Crocodile Lake National Wildlife Refuge, and helped the Irula tribe find the location of and ultimately capture the snakes. Detection dogs, trained by Canine Performance Sciences staff at the College of Veterinary Medicine, use scent profiles of pythons to help target search areas. Pythons are masters of camouflage; however, they release unique odor profiles that the dogs are trained to locate. Even when the snakes are deep in the ground, their odor travels, and dogs can detect it. 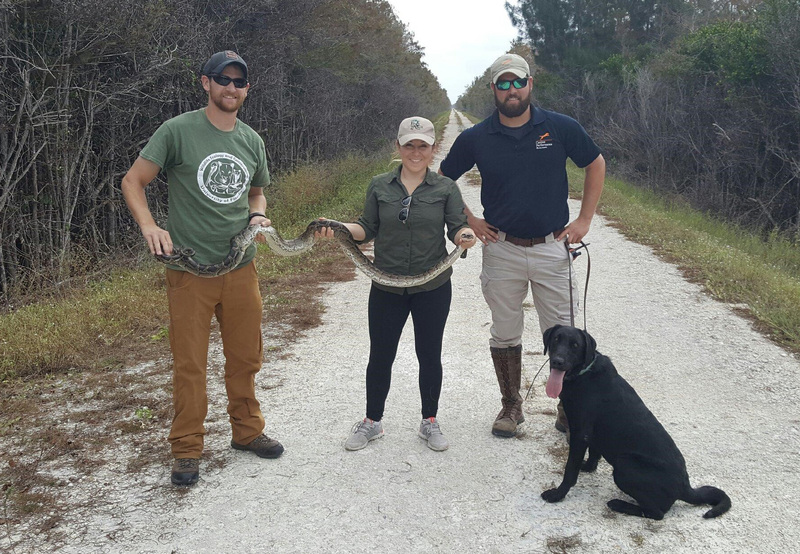 Auburn’s efforts in the Florida Keys are exciting because the canine teams are supporting a multi- agency, multi-university effort to locate pythons in strategic areas of ecological significance. The pythons removed from Crocodile Lake National Wildlife Refuge in Key Largo were first detected by the CPS Canine Teams. Bart Rogers, a CPS canine instructor, and canines Floyd and Vito, located the snakes in an area near a Nike Missile Bunker within the refuge. The FWC and UF/IFAS have been collaborating with public land managers to identify environmentally sensitive areas that would benefit most from targeted python removal. Crocodile Lake National Wildlife Refuge is one such area because of the federally-endangered Key Largo woodrat and many protected bird species which reside there. UF/IFAS wildlife biologist, Dr. Frank Mazzotti, and his team are working with the Irula tribe in South Florida. On Jan. 17, Irula tribesmen, UF/IFAS, the U.S. Fish and Wildlife Service, and U.S. Geological Survey cooperators removed four Burmese pythons from the Crocodile Lake National Wildlife Refuge. Media contacts: Carli Segelson, FWC, 772-215-9459, Carli.Segelson@MyFWC.com; Brad Buck, UF, BradBuck@ufl.edu, 352-294-3303; Janet McCoy, Auburn College of Veterinary Medicine, 334/844-3698, mccoyjl@auburn.edu.